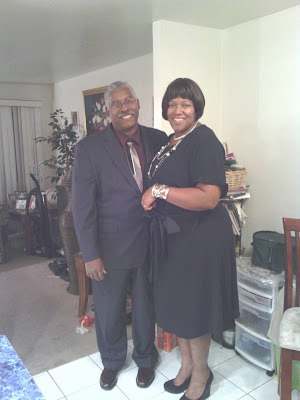 This is hubby and me on our way to our anniversary dinner. I will be using this dress pattern many times. It is very comfortable and I love the way it looks. Sometime before the end of this month I hope to retake picture of the completed sewing projects for the month. I really want to give you a close up on the fabric of this dress it is beautiful. I have a friend who has been apart of my life for over 30 years. She is like a big sister to me. You know the kind of friend that is around so much that everyone just assumes she is a sister and you feel that she is a sister so why correct them. That is her! She is very private so I will call her sisterfriend. She recently had to return home because her mom died. She wrote a beautiful letter to be added to the funeral cermony as tribute to her relationship with her mon and dad. She invited me to come to her family home because her mother was an accomplished seamstress. She showed me her mom sewing room and told me everything in this room belongs to me! I was pleased and honored! This dress was made from one of the fabrics that I received from her. I have deceided to change my sewing room and move it into the game room where the lighting is much better. I can sew while listening to the tv and interacting with the rest of the family. It should be much better. That is the project for the end of this month. My sisterfriend's gift is my inspiration for this change. I must use her gift wisely and I fear that it will just sit if I do not make changes to my current sewing room location. In other news... Betty and I will be working on baby blanket made from her little boy clothes. He is so cute and growing so beautifully. They have a beautiful family. One of the little designers school project is to put on a fashion show for spring. So exciting to get started on that! Starting in January I will start taking some artist workshop classes. Because it is something that I always wanted to do and never did. Hugs!